1596 – Where Did He Go? 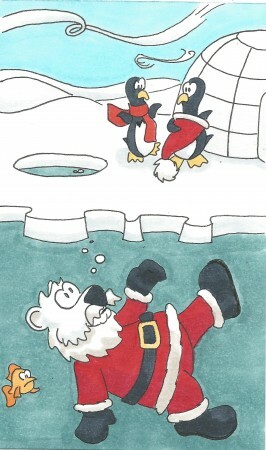 It’w more likely that santa is a polar bear than that there would be penguins on the north pole. where I could find you peeking. You need to know which list I’m on? I’ve caught you as you’re spying. Your cover’s blown. Your secret’s gone. There’s no more point in trying. And we’ll forget you’re busted. Author Samuel KentPosted on November 30, 2015 November 29, 2015 Categories Lunchbox Doodles, poemsTags arctic, bears, Christmas, lunchbox doodles, mutual doodle, penguins, poems, Scarf and Nik-Nak, seasonal, TrumanLeave a comment on 1596 – Where Did He Go?